Question: What were your favorite toys as a child? Before plastic moved into our homes and screens became ubiquitous, we had toys in the 1960s that were sometimes simple, sometimes with batteries. My favorite toys made noise, allowed me to be active and outside, or were technical. Now as I am about to become a grandmother, it’s so much fun to remember these moments of focus and freedom. The earliest toy that I can remember, and one then I had a lot of fun with, I played on the basement floor, in a room in the back of our little semi-detached house at 1224 McKinley St. in Northeast Phila. That room was a combination of my father‘s work room and my mother’s laundry room. How my two parents shared a tiny room with such opposite purposes was a testament to their loving relationship, my father‘s workroom with the dust and metal filings from his drill saw, and my mother’s laundry room with freshly washed underwear. But that room seemed to be a safe haven for me, and I would sit on the plain cement floor with this silly little toy that looked like a horizontal piece of wood with chubby pegs going through it, maybe red, green, and blue. It had four legs that extended up in the air in such a way so that you could turn the toy over and it would pretty much look the same. The idea was to take the hammer attached by a rope and BANG BANG BANG on each peg until it came through underneath on the bottom of the horizontal piece of wood, still attached though. Then I’d turn the toy over and do it again. And again. Ad NOISEium. Clearly I was enjoying imitating my father, who used tools in his fix-it hobby like an artist uses his brushes. But how my mother stood that banging, I’ll never know. Wait, actually I think I have an insight to it now. That’s why I needed to play with it in the basement in the work room, probably with the door closed, far away from anyone else who could hear me banging! But it felt so satisfying. Whatever anger and angst was going through my three-year-old head came through those little wooden pegs. Wait, I found they still sell this toy! It’s called pound-a-peg. Other play happened down the basement too. 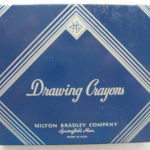 We had a toy chest with the blackboard above it, my mother was a teacher before my brother was born, and I’m pretty sure that she “borrowed” the chalk and the eraser, (I remember they said School System of Philadelphia on the chalk box), such was the perks of a low-paying job of being a teacher, the occasional crayons and pencils found their way home so that when we played school we really played school. 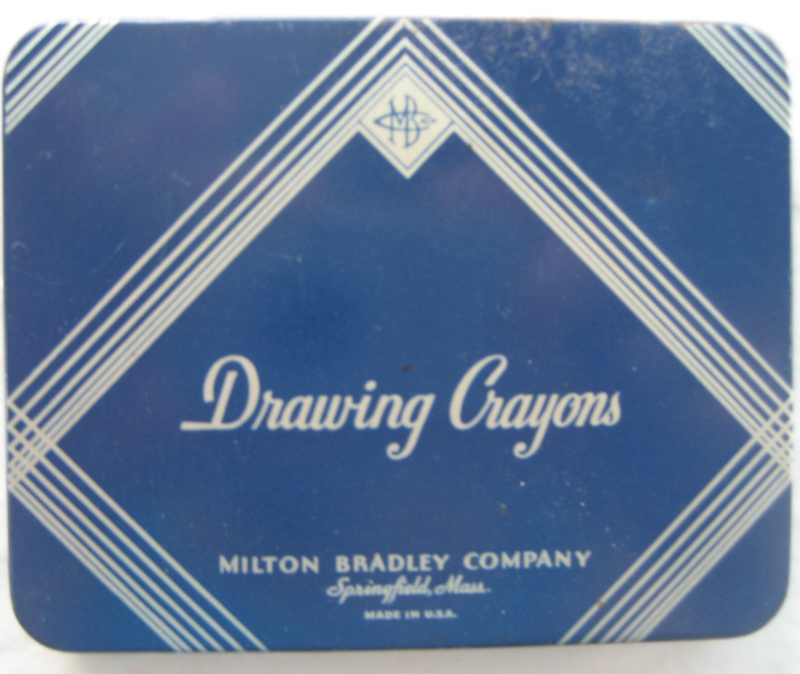 Here’s a box of crayons that my mother kept for years. Maybe she thought of it as part of her pension. Ha! Also down the basement (it was finished, with nice wooden paneling on the walls) we would play board games sometimes, especially during a party. We had Candyland, Monopoly, and one of my favorites was called Operation, where you had to take the tweezers and take a piece out of a body of a plastic man, without touching the side, which made a little buzzer go crazy. Another loud toy I loved! Little did I know of course that I would actually be marrying a guy who became a surgeon years later. He told me that learning how to do surgery was very similar to playing that game.Yeah. Right. One of my favorite ways of playing was to be outside, when I got a bit older, and I would take my brother’s baseball mitt (no one bought ME one, and I never thought to ask for one, pre-title 9 sports) and throw a soft white squishy ball against the side of the house, incessantly, over and over again. At the end of our street was a playground called Tarken playground, which is still there, and sometimes I did the same thing with tennis balls and a tennis racket when I was nine or 10, hitting the balls against the wall as practice. They had tennis courts there, but I don’t remember playing tennis with anyone there as a child, I don’t know if I knew anybody that actually played tennis other than when I was away at overnight camp. When I was a little bit older, maybe 11 or 12, they built an ice-skating rink in Tarken and that was a lot of fun. I had ice skates, and we would walk to the end of the street, and then for a big treat we would get hot chocolate and then continue skating. I think that’s always why I enjoyed skating with our kids so much on the creek in back of our house. I used to ride my bike in back of my elementary school, Carnell Elementary. The back of it was just a big area of cement, nearly one block by one block wide, it never occurred to anyone to actually have children play in a grassy area, but we did have lines painted on the cement for hopscotch and there was an area with a couple of basketball hoops.That was the beginning to a fabulous hobby that I still love today. I used to ride my bike there with my dad, sometimes with my brother. I remember when I got my first bike with two wheels, it wasn’t new, it was a hand-me-down from his friend Harold Fox’s daughter, Linda, who was probably 10 years older than me. Boy did I love that bike. I could only ride in the playground though, I don’t think I really rode on the street very much. 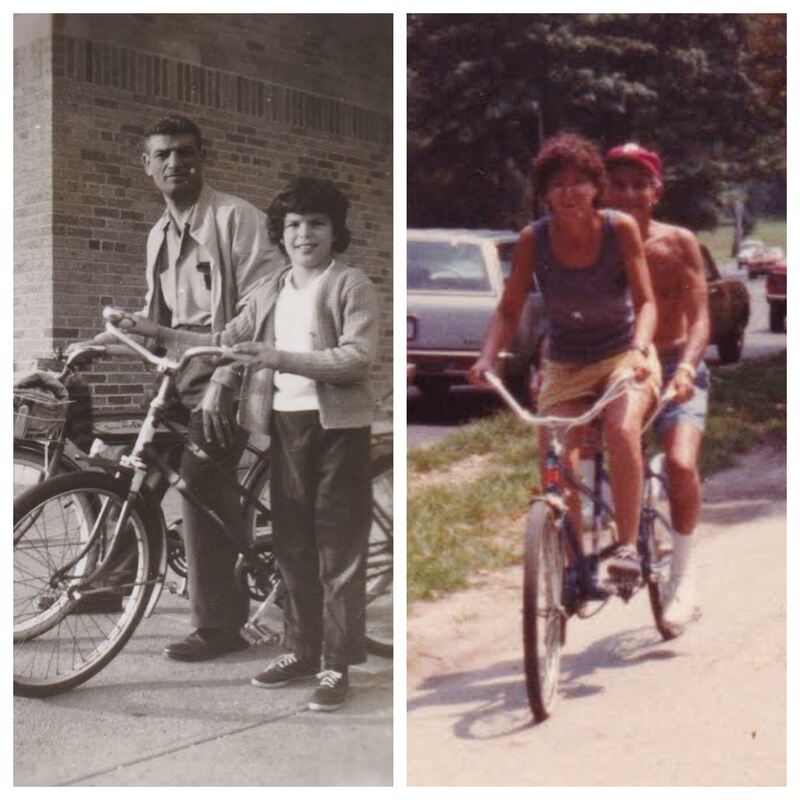 Here is a picture of me with my dad around 1964 in back of my school, and another one riding a tandem bike in the 80s in Philly. I didn’t like to play the games that most girls liked to play. I didn’t like dolls very much. I remember having my bureaus filled with dolls, one special life-sized doll my grandmother got for me in Atlantic City was Pollyanna, but I still didn’t play with that one either. I don’t know if I just didn’t have an older sister to role model playing with dolls or what, but I remember I didn’t like playing with Barbie dolls either, even though I had them and I remember I had some nice Barbie doll outfits too. When you clicked the trigger, it made the sound of a bang and a tiny tiny puff of smoke came out and we once made a movie with Uncle Bill Eisenberg, Grandpop Mort’s brother, where we played Cowboys and Indians. He was a photographer and loved to take movies and photos like my dad. I think my cousin Rob might still have that 2 minute silent movie, it was so exciting to make! One of my favorite toys that I can remember is when I was ten, my parents gave me my own record player. It played 45s, I was so surprised and I remember I had it on the bottom shelf in my bedroom and I just loved it. I bought some Beatles records, like this one. When I was a little bit younger I had a transistor radio. It was yellow plastic and I could hear whatever radio station was closest and loudest, maybe KYW. I had to clip a little alligator clip onto something close by that was metal to help the antenna get the sound, but it seemed very exciting to me at the time as well. As I got a little bit older, I enjoyed puzzles. 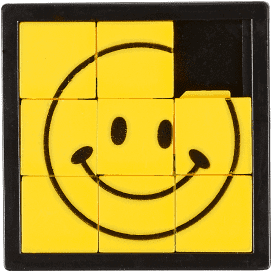 I remember I became proficient at the nine-piece sliding square puzzle, to this day I can still solve it quickly. I remember I had a little camera that took film called a brownie camera, and I loved that camera. My dad and I would develop and print some of the pictures in the dark room in the basement. It all seems so old fashioned now. I used to play cards with my grandmother Bessie, we would play rummy. She was very good at it and whenever she had the card that I needed she always seem to know that and she would hand it to me with a flourish and say, “Here’s the five you need, right?” with her lovely Yiddish accent. I rarely ever could beat my grandmother at cards. Here is a picture of her and me and my mom, and I’m wearing the Brownie camera. Sarah: Thanks for asking about my toys, so much fun to write! All others: Thanks for reading! 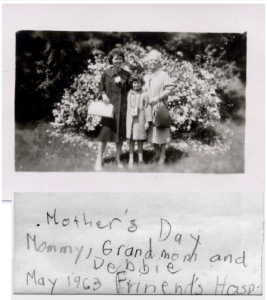 Next week, the writing prompt is about my grandparents.